Happy Thursday, everyone! I must say, I was looking at my Chictopia account the other day, and it allows you to see every outfit in the past like 5 months all next to each other. The conclusion that I came to is that I seriously own a closet full of dresses. It’s great, don’t get me wrong… I LOVE dresses, but every once in a while, I really love styling pants. I’ve done my best to invest in more pants for my Fall wardrobe, so we’ll see how it turns out! Lastly, I’m loving the color combination in this post. 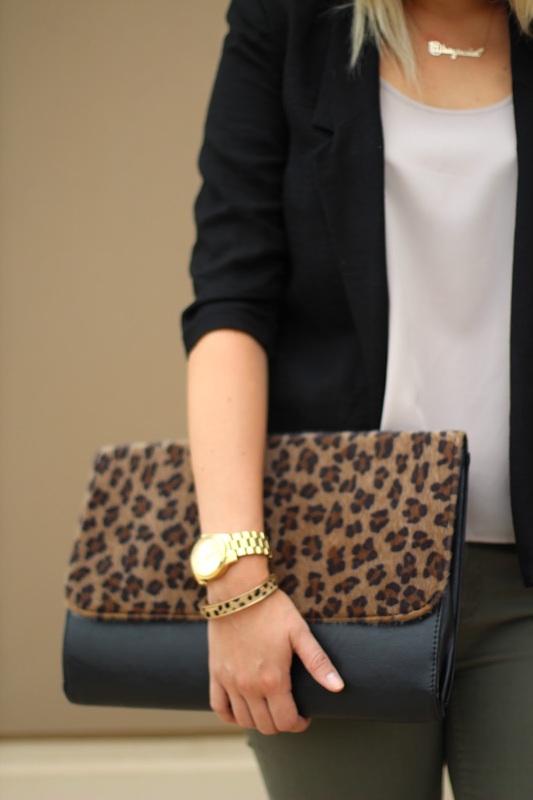 I’ve always loved olive green with animal print- especially leopard! 2. Use the button provided below or link back to the link-up on your blog. 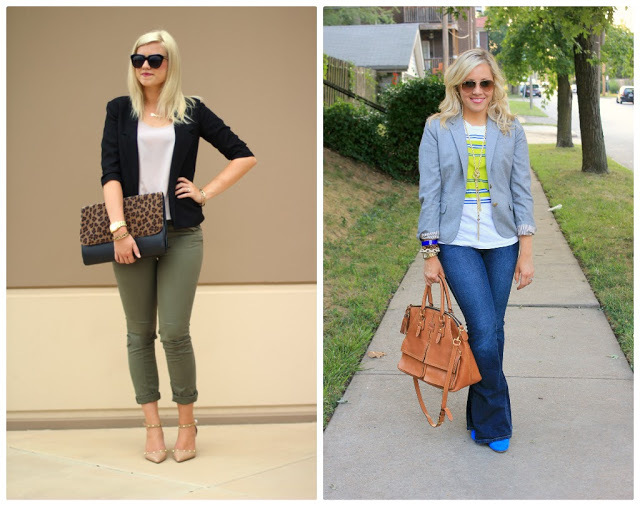 This week’s Spotlight is Nikki from The Fashionable Wife! I absolutely love how she styled the blazer with a graphic tee. One of my favorite things to do… especially in the Fall! Be sure to stop by her blog and say hello! 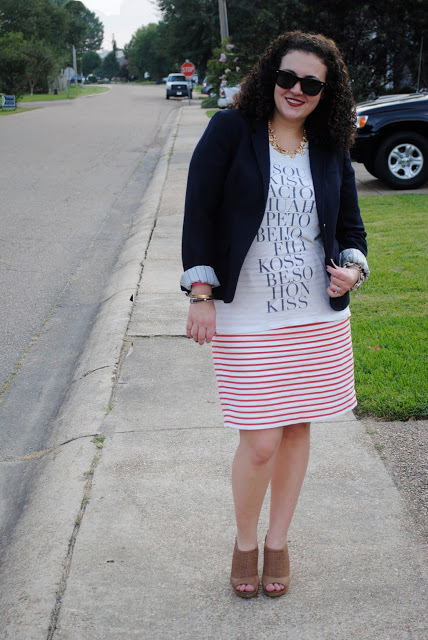 NEXT WEEK: Next week our Spotlight Weekly theme is… PENCIL SKIRTS! See you next Thursday 🙂 Thank you so much for reading, and for linking up! Wow! Such a great outfit! Nice look 🙂 I love blazers! Gorgeous look, Elle – that clutch is perfection and I love how it plays off your bangle! Thanks for hosting! Happy Thursday. I am obsessed with your clutch. 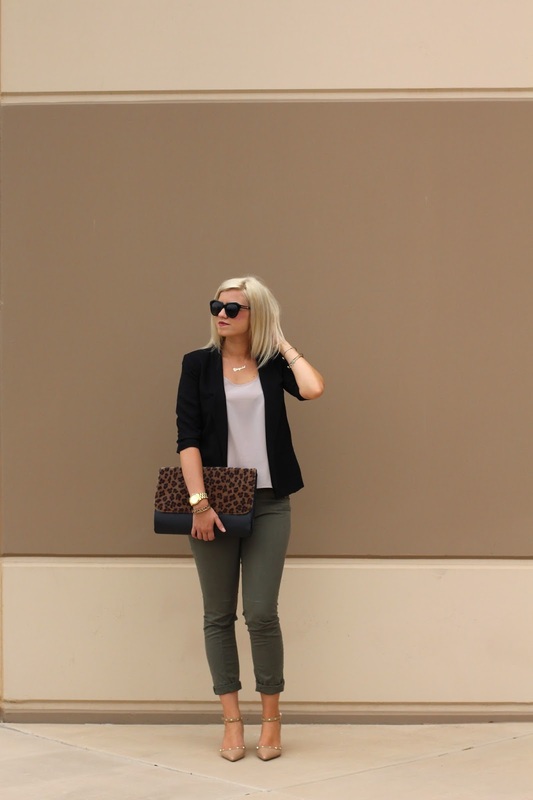 Your clutch with the olive pants is perfection! Both of your looks are great! Love this look, simple and chic! And I love that clutch, gorgeous! Love how simple and class ythis is! I like your interpretation the best–not only is it neutral and classic, but those pumps remind me of the Valentino rockstuds. Those shoes are fabulous. What a great alternative to the Valentino ones. Visiting from the link up. Love your outfit. I would love it if you stopped by and linked up to my weekly Tres-Chic Fashion Thursday link up, live now. I am loving your clutch!! It's so cute. I'm not sure if I can think of a better combination than olive, black, and leopard. You look fantastic! Love the colour combo, your heels are gorgeous! Thank you so much for linking up with What I'm Loving Fridays! I'll be sure to come by your link up this week 🙂 Love your look – so classic and chic!